Whether you want to travel, communicate with friends or colleagues, reconnect with family, or just understand more of what’s going on in the world around you, learning Japanese will expand your horizons and immeasurably enrich your life. • 80 minutes of reading instruction to provide you with an introduction to reading the Japanese katakana script or alphabet. These lessons are designed to teach you to sound out words with correct pronunciation and accent. • 60 minutes of recorded Culture Notes to give you some insight into the Japanese language and culture. 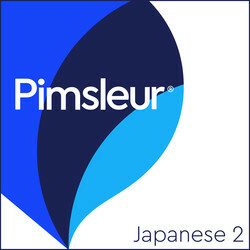 Builds upon skills taught in Pimsleur’s Japanese Level 1. Reading lessons are included in this program. In these lessons, you will begin to learn to read the katakana alphabet. One hour of recorded Cultural Notes are included at the end of the reading instruction. These Notes are designed to provide you with some insight into Japanese culture. A Culture Notes booklet is included.